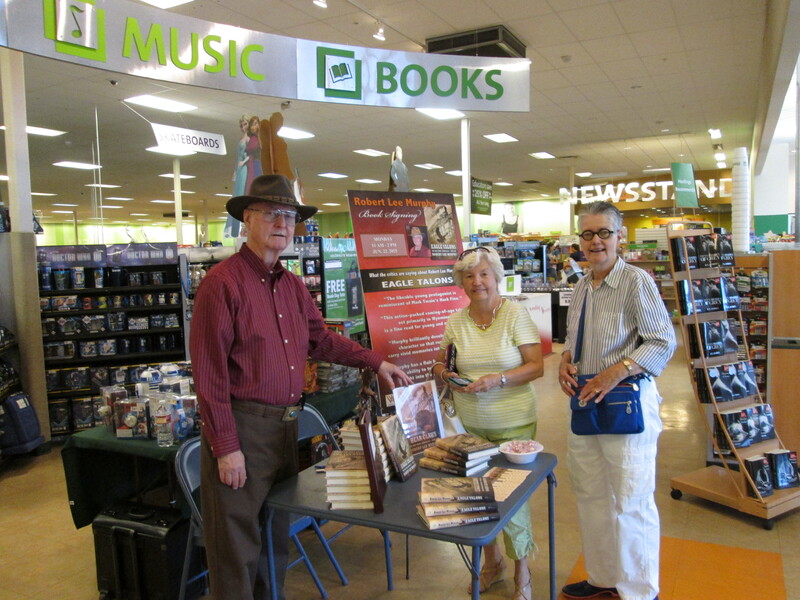 The book signing at Hastings in Farmington, NM, was a great success. Several books were sold and autographed, many bookmarks were distributed, and I had the opportunity to discuss Eagle Talons, The Iron Horse Chronicles–Book One, with many interested readers. I am grateful to Hastings for hosting this event. This photo shows me talking about my writing with my two sisters, Suzy Fisher and Donna Murphy. We took advantage of a mini-family get-together to do the book signing. Suzy lives in Farmington with her husband Gary Fisher. Donna came to join us from Santa Fe, NM. Also attending our little reunion were Suzy’s son Eric Fisher, his wife Teri, and their daughter, Katherine, all of whom live in Farmington. When this post about the Farmington book signing is released, I will be traveling back home to Nevada after attending the annual convention of the Western Writers of America in Lubbock, Texas, and following a presentation and book signing at the Western Heritage Museum and Lea County Cowboy Hall of Fame, in Hobbs, NM. I will post blogs about both of those events in coming weeks. This entry was posted in Book Signing, Eagle Talons - Book One, Museums and Parks, The Iron Horse Chronicles, Writing and tagged Adventure Fiction, Eagle Talons, Frontier Fiction, Historical Fiction, Middle Grade Fiction, Museums, Teen Fiction, The Iron Horse Chronicles, Western Fiction, Western Writers of America, Writers' Associations, Young Readers. Bookmark the permalink. Good for you Robert, keep it up. Scotty.